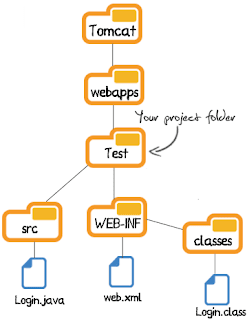 Web.xml mapping servlet names improve web app's flexibility and security..The deployment descriptor (DD), provides a "declarative" mechanism for customizing your web applications without touching source code! <servlet>Maps internal name to fully-qualified class name. <servlet-mapping>Maps internal name to public URL name. 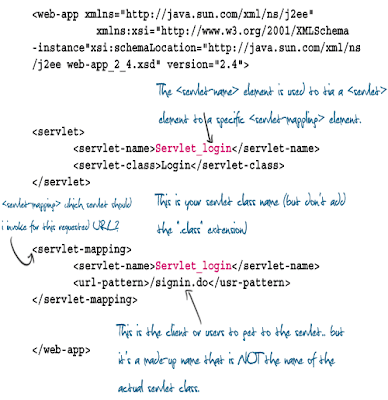 <servlet-mapping> which servlet should i invoke for this requested URL? signin.do file mapping to Login.class. So the client or users to get to the servlet.. but it's a made-up name that is NOT the name of the actual servlet class. Considering all the articles available on the web and in books to explain web.xml, this isn't showing any more than the first few pages would inform the user of. In addition, most .do extensions tend to be struts(1) apps where there is a filter decalred in web.xml that will pass all .do url requests to struts to load up the relevant action class. If you were to code web.xml mappings as you have done then you would come a cropper when introducing struts for example, so it may be best to stay off the .do mapping to standalone servlets. I personally liked the images & illustrations. Nothing to complain.